There are many legends surrounding house calls. The classic story is the small provincial bookseller called to a substantial mansion on the edge of town, full of valuable books. The new owner has inherited the collection and is selling the house and trying to sell all the contents, including the books. The bookseller is overwhelmed by the sight of rows of pristine signed Rackhams, rare bound books of 18th century travel, 19th century literature fine in the original cloth, even the odd 20th century classic like a first signed Ulysses and a wrappered Gatsby. And then are the rows of exquisitely bound sets...He decides the collection is too rich for his blood and and, as they now say, 'above his pay grade' - so he puts the collection on to a prestigious West End shop for a 10% finder's fee. Later that week the London dealer swings by his local side street shop in a bloody great long wheel base Merc van full of boxes of books and hands him a £1000. Somewhat put out, the local bookseller asks what happened. 'I asked the chap if he had a figure in mind and he said he wanted £10,000,' replies the suave metropolian bookseller. A very sad and morally dubious story. However the 'level of expectation' (LOE) of the buyer is an important factor in any house call and if it is too high the buyer can be wasting his time. In many instances only a part of the collection has value and the buyer will only sell if you take the lot - 'no cherry picking.' In the case of a collection of 30,000 books in a country house in Essex we took the lot but were able to arrange for half the books (nasty ex library dogs) to go to the local dump. Even that was costly. In the case of some collections it can take a week to remove the books and one can end up spending hundreds of pounds just on boxes. 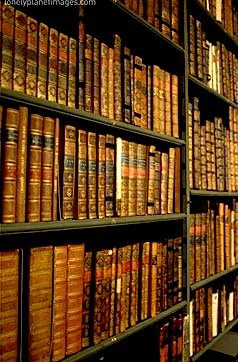 Some booksellers have bought collections so vast and valuable they have sold their houses, if not their souls, to pay for them... to be continued..